Barnet FC were formed in 1888, having formerly been known as New Barnet FC (1885–1888) and Woodville FC (1882–1885). 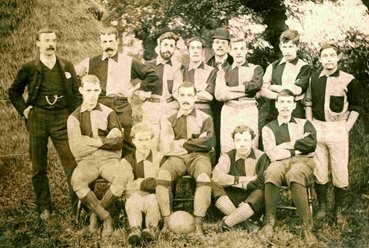 They were known as "The Hillmen" and played in New Barnet before moving to Queens Road in 1889. Initially they played friendly games before becoming inaugural members of the North London League in 1892–93. They went on to have success in the North Middlesex League Division II (1894–95 runners-up), Division I (1895–96 runners-up) and the Premier Division (1896–97 champions). Promoted to the London League Division II, Barnet became champions in 1897–98 and spent the following seasons in London League Division I before ceasing to exist in the 1901–02 season. Two local clubs, Barnet Avenue FC (formed 1890) and Alston Works AFC (formed 1901) continued to attract support. Barnet Avenue renamed themselves Barnet FC in 1904 and as staunch believers in the amateur game they shunned the London Football Authority in favour of the Amateur Football Association. Alston Works AFC, later Barnet Alston FC, became champions of the London League in 1906/7. In 1907 they moved to the club's current ground at Underhill, Barnet Lane. Their first match was a 1–0 win over Crystal Palace FC on 14 September 1907. After merging with the Avenue team in 1912 they spearheaded the new Athenian League as Barnet and Alston FC. After the First World War in 1919 they became the third instance of Barnet FC. This team continues today. For over 50 years Barnet FC competed in the Athenian League. Inaugural members in 1912/13 they were league champions no fewer than seven times between 1919–1965 before turning professional in 1965. The 1930/1 season saw Barnet gain their first Athenian League Championship to be repeated again the following season. Included in the team at that time were George Hughes and Fred Garrett, full backs; Reg Wright (England), centre-half; and Arthur Morris, Jack Richardson and a Barnet and England legend Lester Finch in the forward line. In the two seasons after World War II, Barnet won the FA Amateur Cup (beating Bishop Auckland 3–2), the Athenian League Championship twice, and the London Senior Cup. The side included five internationals in Ted Bunker, George Wheeler, Dennis Kelleher, Ron Phipps and Lester Finch. In the 1958/9 season, their young team coached by George Wheeler, reached the FA Amateur Cup final for the third time, but were beaten 3–2 by Crook Town. In 1965–66 Barnet turned semi-professional. Before the season commenced, manager Dexter Adams made two astute signings. He persuaded Les Eason, then 20 years of age, to join from Finchley and then acquired amateur international Barry King from Hitchin, who became the first player to sign professional forms for the club. The first game finished in Barnet’s favour, a 10–1 win over Hinckley Athletic. Les Eason went on to score 31 goals in his first season as the club became champions of the Southern League Division I. Promoted to the Southern League Premier for 1966-7 the club ended up 5th but had reached the Southern League Cup final only to lose to Guildford City over two legs. In 1969–70 the FA Trophy was introduced and Barnet reached the semi-final before losing to Macclesfield 0–1 at Stoke. The club reached the third round of the FA Cup the following season, but lost 1–0 to Colchester, who went on to knock out Leeds in the next round. That year's cup run included a 6–1 first round win over then Fourth Division Newport County, equalling the competition's all-time record for a win by a non-league side over league opponents. The 1971–72 season proved one of the most successful. Using just 15 players for 80 competitive matches Barnet reached Wembley in the FA Trophy, losing 3–0 to Stafford Rangers and reached the final of the Southern League Cup, drawing 2–2 with Hereford on aggregate. The replay, played next season, was a 2–2 draw but Barnet went on to win 7–6 on penalties. In 1972-3 Barnet put up a tremendous fight against Queens Park Rangers in the third round of the FA Cup. The match at Loftus Road ended 0–0 and the replay at Underhill drew in excess of 11,000 spectators. Rangers eventually won 3–0. In 1975 Barnet were relegated back to the Southern League Division One South but two years later they won the championship and returned to the Southern League Premier. It was during this period that many famous names played for the club including Jimmy Greaves, Marvin Hinton, Bob McNab, Terry Mancini and John Fairbrother. Jimmy Greaves, although playing in midfield, still ended the season leading goal scorer with 27 goals. By virtue of their Premier Division positions in seasons 1977-8 and 1978-9 Barnet were given a place in the newly formed Alliance Premier League. In the first three Alliance seasons, Barnet just avoided relegation, but in 1982-3 they finished 15th and a year later 9th. Then in 1984–85, when it looked like Barnet would face relegation, manager Barry Fry left to take charge at Maidstone United. The season was resurrected under the guidance of ex-player Roger Thompson losing only one of their remaining thirteen league games. The 1992–93 season saw controversy at Underhill as Barnet chairman Stan Flashman regarding club accounts and players' wages, resulting in some nationwide back page headlines. Flashman also brought his son, Mark, to the club as a reserve goalkeeper. In spite of the financial problems, Barnet finished third in the new Division Three and secured the final automatic promotion spot. Manager Barry Fry, however, left Barnet with a handful of games remaining and was replaced by his assistant Edwin Stein, who himself then left to join Fry in the summer at Southend United. Goalkeeper Gary Phillips took over as manager during a difficult summer in which Barnet marginally survived a vote of expulsion by a Football League EGM, and lost the vast majority of their promotion winning side in a tribunal which nullified the players' contracts. Phillips cobbled together a squad from the few remaining player and free transfers. In January 1994 Phillips was assisted by former England goalkeeper Ray Clemence, but were still relegated from Division Two. In August 1994 Ray Clemence became sole manager for two seasons, finishing 9th and 11th in Division Three. Then at the start of the 1996/7 season Ray Clemence left to become England goalkeeping coach leaving Terry Bullivant in charge. Barnet's first season in Division Two ended in relegation and Clemence left in 1996 to be replaced by Alan Mullery (after a brief caretaker stint by Terry Bullivant and Terry Gibson). During the years up to 2000 Barnet established themselves in the basement division reaching two playoff semi-finals under new manager John Still, losing to Colchester United and Peterborough United respectively. But the club lost its league status in 2001 after ten years following a season which had seen Still resign and briefly be replaced by Tony Cottee before Still was reinstated. Still resigned again shortly after Barnet's return to the Conference and was replaced by Peter Shreeves. Shreeves left after one year to be replaced by Martin Allen, who in turn left the club in March 2004 (to take charge at Brentford). Former Stevenage Borough manager Paul Fairclough replaced Allen for the remainder of the 2003–04 season, including the play-off matches against Shrewsbury Town, which was taken to penalties after a 2–2 aggregate score (Barnet won 2–1 at Underhill, Shrewsbury Town winning 1–0 at Gay Meadow), with Shrewsbury Town winning 5–3 on penalties. The following season, 2004–05 , with Fairclough at the helm, the Bees went one better than the previous season and were crowned Champions of the Conference National and regained their football league status, after amassing an impressive 86 points in the season, and scoring 90 goals with it. Barnet also finished 12 points ahead of their nearest rival, Hereford United. The 2008–09 season started poorly, and by late September only the three teams that had been docked points prior to the start of the season had lower league positions. After a run of thirteen games without a win in any competition Paul Fairclough announced his resignation to take up a role as director and leaving the first team duties to his assistant Ian Hendon. Fairclough would take over one last game which resulted in a 2–0 win against another relegation threatened side AFC Bournemouth. Results improved, and before the end of the season Hendon was made permanent boss on a 2 year contract. The Bees stayed in Football League Two for the following 2009-10 season, which started with four wins from their first six games. A poor run of form would follow, including a 13 game winless streak, and after five consecutive defeats left the Bees close to the relegation zone, Ian Hendon was sacked in April with two games of the season remaining. Paul Fairclough returned as caretaker manager for the last two games and guided the Bees to safety with a 1–0 win at home to Rochdale on the last day of the season. On 1 June 2010 Mark Stimson was appointed as the new manager and after a poor start to the season was sacked on 1 January 2011. Traditionally, the club's main rivals were Enfield. The two clubs were amongst the biggest in Non-League during the 1980s and matches between them were fiercely contested. Enfield suffered off-field problems and the original club has since ceased to exist after the formation of the breakaway club Enfield Town. As such, the last clash was in 1991, in the FA Cup, a match which Barnet won 4–1. The Bees did play new club Enfield Town in a friendly in 2006, however. With promotion to the league in the 1990s, rivalries developed with the likes of Leyton Orient and Fulham though neither reached the mutual hatred felt with Enfield, especially with Fulham's meteoric rise to the Premiership. More recently a rivalry developed with Hertfordshire outfit Stevenage Borough during the club's stay in the Conference between 2001 and 2005. The rivalry grew with home and away attendances increasing with every game played, but with Barnet's promotion in 2005 and Borough's continued failure to follow suit, the sides have only met in the Herts Senior Cup since. This will change in the 2010-11 season, after Stevenage's successful promotion to League Two,the match ended in a 3-0 win to Stevenage. Similarly, matches with Brentford have been dubbed "The Battle Of The Bees" owing to the two sides being nicknamed The Bees. The rivalry is generally good natured, with the two sets of supporters exchanging nickname-based taunts. There have always been problems with the ground, Underhill, which is in need of modernisation. A controversial sale of the ground's freehold in 2002 to the Club by the London Borough of Barnet has failed to produce any changes to the stadium. Meanwhile, the council have publicly said they will do what they can to help the club but this help has never materialised; indeed, many Keep Barnet Alive (KBA) supporters consider the loss of the local council seat to the Conservative Party to have been detrimental to their cause. Attempts by the club to sort out the ground issue, either by making improvements to the current site or by finding a site elsewhere in the borough, have so far failed. Recent negotiations with Barnet Council have resulted in a new planning application to modernise the existing ground. This includes rebuilding both the north and south stands to comply with the League requirement of 2,000 additional covered seats. After some modifications this application was passed by Barnet Council's planning committee in December 2007 and building work commenced on a new South Stand. The building work progressed at incredible speed and it took only a month for the new stand to be built. Work also took place on a new North Stand, this involves a small, temporary, covered structure, just to the right of the North Terrace. Away fans now use this seating. Although the club have had its trouble with the council and others who do not care if they move out of the area the fact is that Barnet F.C has been a part of the town for over 100 hundred years. Many parents are thankful that their children have somewhere to go and many supporters are the back bone of Barnet. Although the average attendance might be a couple of thousand there are many more in the town who look to Barnet’s results when ever they are playing. As you caan see this was written some time ago and to many the real Barnet ceased to exhist when they moved away from Underhil and the Borough.